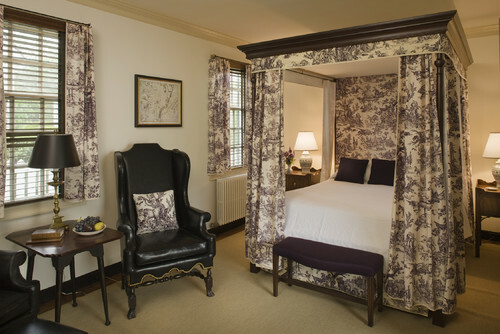 Traditional Bedroom by Chicago Interior Designers & Decorators Branca, Inc.
Toiles –– also called Toile de Jouy –– got their start in mid-eighteenth century Ireland, and shortly thereafter became increasingly popular in France and Great Britain. The decorative fabric is most often cotton or linen printed with pastoral or colonial scenes. The factory of Jouy-en-Josas, near Versailles, became famous for toiles. The notably French fabric usually comes in a white or cream-colored background, with the pattern printed in a different color, such as black, red, blue, green, brown, or beige. Many decorators have a love for toile wallpapers, specifying them in baths, dining rooms, libraries, and just about any room in the house. You’ve probably noticed toiles grace the pages of magazines, and liven up furnishings, windows, and walls of showhouses. Used mostly in traditional rooms, the classic textile has made a comeback in the past 10-15 years. 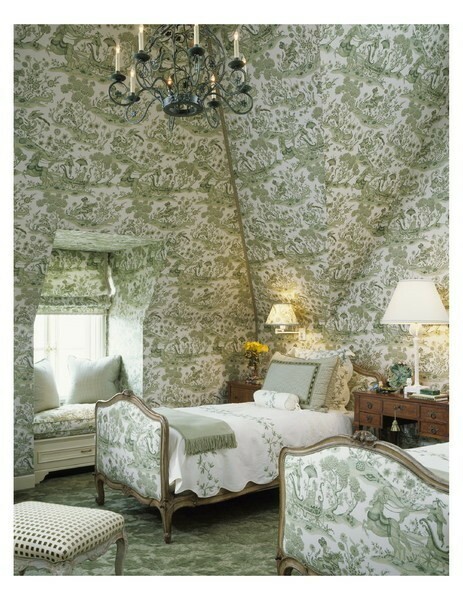 One of my favorite spaces in which I’m fond of toile is a bedroom. 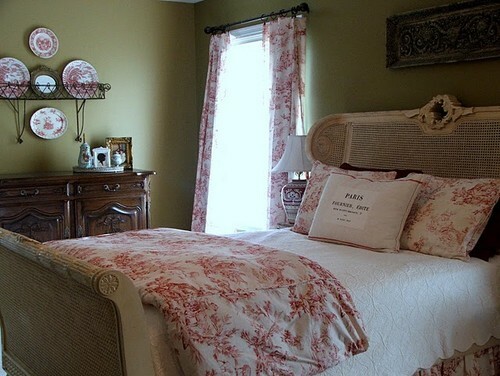 These five sleep spaces look lovely in Toile du Jouy. What a gorgeous guest room. The toile-upholstered walls, bed, and window seat should almost be overkill, but the amount of pattern works well. Subtle green and white at its best. Touches of toile make this bedroom feel inviting and distinctly French. Notice how the red and white plates continue the theme. I can’t help but adore this crisp yellow contrasted with the dark wood furniture. 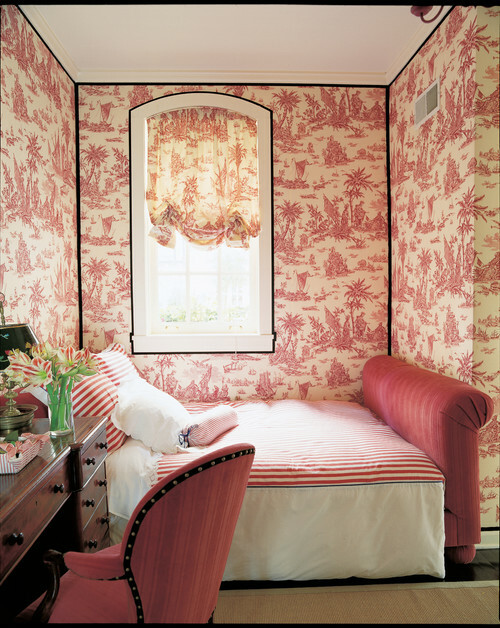 Botanical prints marry well with the not-so-typical “unbusy” theme of this toile room. Highly traditional and incredibly elegant, black and white toile sweeps through this large bedroom making a design statement. 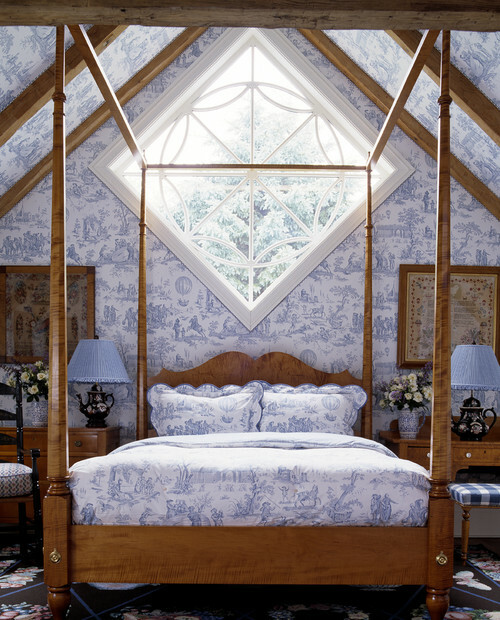 Blue and white toile dresses up this bright Hamptons garage bedroom. Interior designer Anthony Baratta chose complementary patterns for the area rug, seating and artwork, creating a delightful, happy space.